NASA's second-ever, two-day International Space Apps Challenge yielded dozens of new tools and concepts, from apps to check the weather on Mars to designs for greenhouses that could grow plants in space. 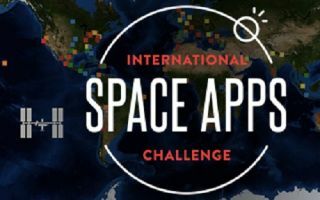 While the overall global prizes have yet to be announced, the space agency has picked four virtual winning teams from the space apps hackathon that took place April 20 to 21. Inbound: A minimalist LED display that lights up to show when the Earth is being bombarded with coronal mass ejections erupting from the sun. Mars Watchtower: An interactive web-app that allows users to check the weather on Mars, much like they would check the weather on Earth. Asterank NEO Database: A tool for browsing roughly 600,000 cataloged near-Earth asteroids and visualizing the path of these space rocks in our inner solar system. Waystation: An iPhone app that alerts users when they can spot the International Space Station in the sky above them. Local prizes were given out at the end of each in-person Space Apps event. From those winners and the virtual awardees, an international judging panel will select global winners for each of the following four categories: best use of data; best use of hardware; most inspiring; and biggest galactic impact (or most likely to improve life on Earth or in space.) There will also be an online public poll, and the project that gets the most votes will win the People's Choice award. The winners will be announced on May 22.